An oversized visitor made a surprise appearance inside an Atascadero pediatrics office Thursday afternoon. 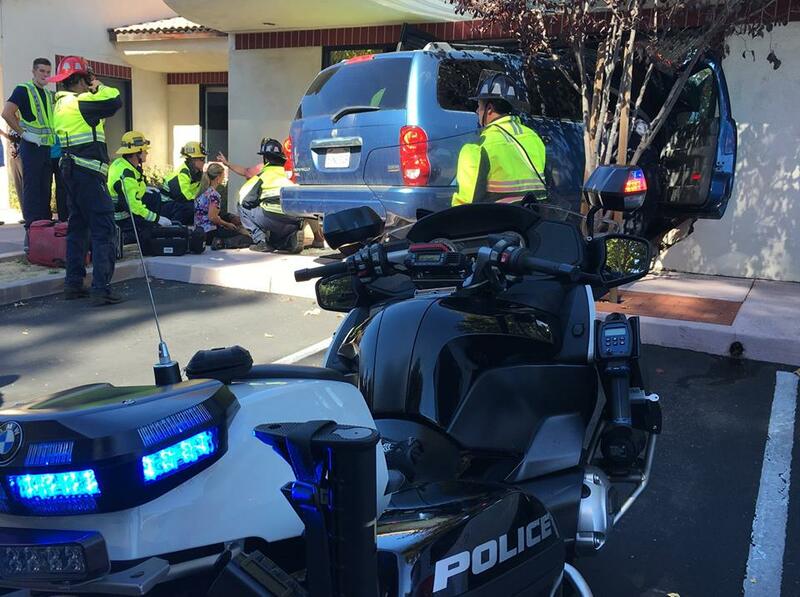 A Dodge Durango SUV slammed into and through the exterior wall of Patterson and Tedford Pediatrics and came to a rest in the lobby of the doctors’ office at 7700 Morro Road. Shortly before the crash, an employee of the office moved from the area avoiding injury. No one inside the building was hurt, according to the Atascadero Police Department. The female driver, who pulled out of a parking spot and then drove into the building, suffered minor injuries. The driver exited the wrecked SUV on her own, and fire crews found her on the ground when they arrived. A city building inspector examined the doctor’s office following the crash and determined no load-bearing walls or support beams had been damaged. The city allowed work to continue on the pediatrician’s side of the building. I’m just grateful no one was injured. That can be a busy waiting room, with lots of kids milling about. Multitasking ? Is this one of the empowered multitaskers I see on the road, you know, in an urban assault vehicle, chatting on the phone, eating the burger, checking the e-mail, visiting the doctor’s office…..oh so empowered…..but still only one Central Processing Unit. You witnessed the incident? Tell us more!